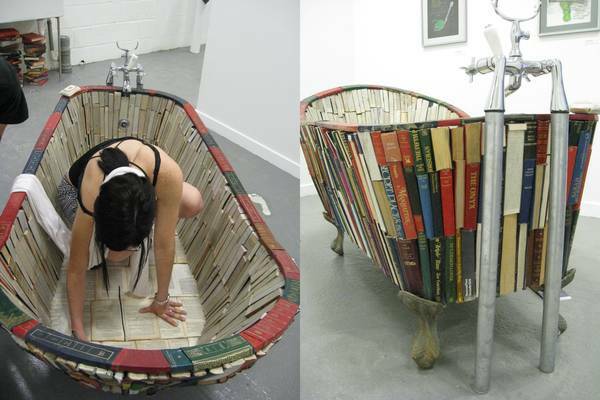 Functional Bathtub Made from Books! This is amazing. We discovered this on the blog Bookshelf. This bath is made entirely out of books which Vanessa Mancini cut and fitted together over a metal frame to form a bath of books, which is suspended by four antique bath tub, lion-shaped feet. She intends to later cover it in layers of resin and has already applied proper taps and drain, so that it will be a utilizable, functional bath at all effects.  Archived in Best Places to Drink in New York City, Literary Randomness. Bookmark the permalink.